Opt-in push messaging plays a big role in providing the kind of personalized experience that has created such intense bonding between users and their iPhones, Androids and other smart devices. A new study-the Urban Airship Push Messaging Index-spotlights the enormously beneficial metrics that come from "Good Push" messaging. The study refers to "Good Push" because it is imperative that opt-in messages be highly relevant to the user, and focused on meeting their needs. 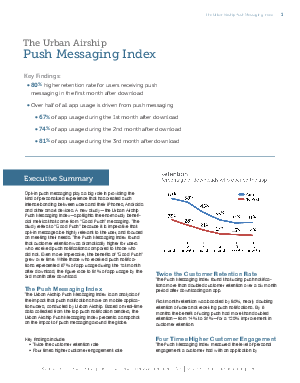 The Push Messaging Index found that customer retention was dramatically higher for users who received push notifications compared to those who did not. Even more impressive, the benefits of "Good Push" grew over time. While those who received push notifications represented 67% of app usage during the 1st month after download, the figure rose to 81% of app usage by the 3rd month after download.